Our 12-day trip has been designed to maximize your experience here and have you begging to stay forever! Instead of rushing around in a panic trying to visit as many places as possible, we've specially chosen three locations, plus San Jose that we know you'll fall in love with. How are we so sure? Well, we've tirelessly tested out beaches, bars, bungalows and bit of booze just to make sure we can bring you the cream of the crop. We genuinely love Costa Rica and can't wait to share this paradise with you! Costa Rica is jam-packed full of opportunities to keep active, whether it's excitement you're looking for, cultural experiences, or checking out the stunningly unique flora and fauna. 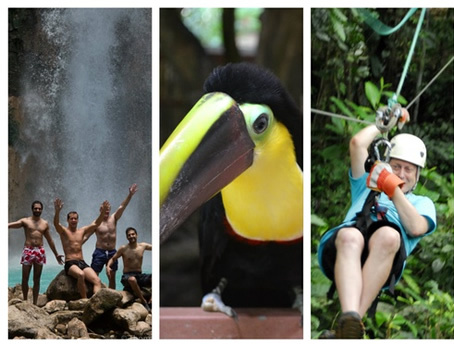 Listed below are just a few of the activities that are available to us during the Costa Rican adventure. Our unhurried travel concept gives our travelers enough time to take advantage of as much (or as little!) as you like to make this your trip of a lifetime! ** - Trip prices based on twin share. Traveling solo? We'll match you up with another traveler at no extra charge, or just pay a $870 single supplement for your own room! 12 days in paradise that you'll never forget! 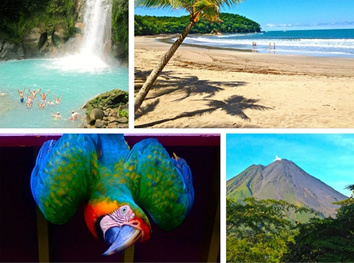 Costa Rica is an incredibly diverse country with unlimited opportunities for adventure or relaxation set among some of the world's best beaches, rainforests, and volcanoes. Most travelers will arrive in San Jose on day one and head to our meeting spot to start the adventure. This time in the capital city of San Jose is a great introduction to the incredible country of Costa Rica as well as our first chance to get to know our fellow travelers. In the evening we'll have an authentic Costa Rican buffet dinner which will allow everyone to find which foods are their favorite right at the start! At night you'll have the opportunity to immerse yourself into some authentic Latin nightlife, so brush up on your Salsa dancing skills! Costa Rica's largest city, and capital city, San Jose is the starting and ending point of our Costa Rican adventure. Situated in the Central Valley, and squeezed between two active volcanos (Poas and Irazu) this vibrant city is full of theatres, parks, and museums. San Jose is also the bustling business and shopping center of the country and accounts for almost half of Costa Rica's 5-million residents. Located halfway between the eastern Caribbean coast and the western Pacific coast and at an elevation of nearly 4,000 feet, the climate of the city is generally quite a bit cooler than the coastal areas. Gay life in San Jose is vibrant and quite well accepted, especially relative to other large Central American cities. With several nightlife options from tame to wild, the social scene here is alive and ready to entertain those looking to check out Latin gay nightlife. On day 2 we travel north of San Jose to the area of Arenal, famous for its very active volcano, gorgeous scenery, and lots of opportunities to keep active with zip lines, hiking, canopy adventures, and more. Along the way we'll head up to the crater's edge of the very active Poas Volcano. In the evening we'll even take you off the beaten path, away from the crowds, to a hot springs waterfall oasis hidden in the jungle... as long as you promise not to share the location with the world! Your three nights here are your opportunity to be as adventurous as you'd like, this area definitely won't limit you! The Arenal area of Costa Rica is jam-packed full of amazing sights and activities no matter what you've come to Costa Rica for. We'll have time here to head onto the old lava flow of the Arenal Volcano, zipline down one of the longest ziplines in the world, rappel down a waterfall, or just soak away an afternoon in the hot springs pools. We've scouted out the best spots for all of these activities including a hidden hot springs waterfall oasis, tucked away from any crowds, which we'll bring you to if you promise not to tell the whole world where it is! Just imagine being surrounded by jungle while basking in the warmth of natural hot springs. Paradise. Our accommodation in Arenal is tucked away in the beautiful outskirts of the town of La Fortuna which ensures you get the best of the area while avoiding the tourist traps. Tackle your bucket list here in Arenal while surrounded by the jungles, mountains, and wildlife that have made Costa Rica's scenery famous! On day 5 we continue down the road to our own private villa for the next three nights! Both of our private luxury villas are nestled in the Costa Rican jungle offering our groups incredible opportunities for exploring hidden waterfalls or beaches, as well as lots of activities to choose from! Relaxing in the outdoor jacuzzi at the end of the day, under the stars, listening to the sounds of the jungle is a moment you'll want to hang on to forever. Our Jungle Villa stop is an incredible opportunity to get off the beaten track and explore the landscape that makes Costa Rica famous. Both villas offer endless hiking trails, stunning swimming pools, luxurious accommodation, and are fully catered by our own private chefs! Whichever villa we happen to stay at during your specific trip, we'll be well taken care of for 3 nights at our beautiful villa. Tucked away the in the dense jungle of Costa Rica's southern zone sits a stunning Las Aguas mansion built on a 60-acre property full of waterfalls and hiking trails. The pool and Jacuzzi are perfectly positioned on a hill overlooking the surrounding lush rainforests. After a long day of exploring, there's no better place than that Jacuzzi to sit under the stars listening to the sounds of the jungle. Stress hates this place and stays very far away from it. The surrounding area is off any beaten path and is as Costa Rican as you can get. Our local hosts here are committed to keeping their guests happy and they do a great job of it too! Horseback ride to one of the country's tallest waterfalls, head to Playa Dominicalito for some more beach time, or just explore the trails on our vast jungle property. Our Guanacaste property is tucked away in the dense jungle up a hill overlooking the ocean and jungle and only a few minutes walk from a secluded beach. The infinity pool is a beautiful spot to soak up the postcard-worthy view and unforgettable sunsets over the Pacific Ocean. The villa is surrounded by flora and fauna so don't be surprised if a toucan pops in for a peek at us, or if the howler monkeys howl at us from the back porch. Despite how off-the-beaten-track our property is, the area is full of a wide array of activities to keep everyone as busy as desired. Our local hosts are proud ambassadors of their home and are always ready to ensure our time here is one we'll be bragging about to everyone back home. Manuel Antonio is known as one of the most diverse areas for flora and fauna with all kinds of monkeys, reptiles, birds, sloths, and plant life of course. It's also known as the gay beach area of Costa Rica with a lively community of gay guys from all over the world! 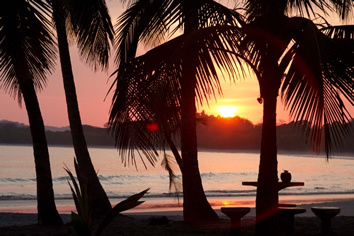 Spend your day at the beautiful white-sand beach, or checking out the incredibly abundant life in Manuel Antonio National Park, then spend the evening experiencing Manuel Antonio's social life. Included in the trip is a guided walk through Manuel Antonio National Park with Gama, a local wildlife expert who is an incredibly talented and knowledagle wildlife spotter. This coastal paradise is situated where the jungle meets the sea. 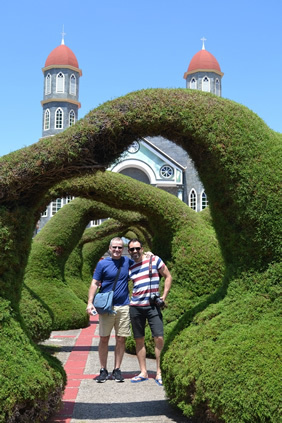 While we won't want to leave our stunning all-gay property perched on a cliff over the Pacific Ocean, there's definitely enough to see and do in the area that you really should drag yourself out of the infinity pool to check it out! Manuel Antonio National Park is at at the bottom of the hill and known as one of the best places in the country for spotting Costa Rica's incredible flora and fauna. With monkeys, reptiles, sloths and thousands of bird species calling this place home, it's not difficult to get up close and personal with Costa Rica's famous wildlife. We'll know you'll fall in love with them, but no, you can't take them on the plane home with you, sorry. Outside of the park, the area offers tons of adventure activities if keep busy is your thing. We've got lots of options to keep us busy here, including canyoning, ziplining, surfing, or just hitting the beach, and if we've got enough energy in the evening, Manuel Antonio's gay social scene is there for us! We travel back into San Jose for one more dinner together and poolside drinks at our hotel pool before saying our adios for now's! If your flight time permits, maybe take a quick trip out to one of the volcanoes in the city! 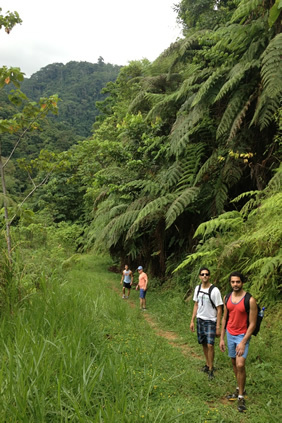 And if you've got an extra few days we'll set you on the right path to continue experiencing this Costa Rican paradise. Don't worry about getting chilly, at only 8 degrees from the equator Costa Rica has a tropical climate year-round. Temperatures here generally average highs of 27C/81F, and lows of 21C/70F, although it can get chilly when we hit high elevations so it's a good idea to bring a light jacket and a pair of pants. If it rains it's usually in the afternoon, and these unlikely showers are a refreshing cool-down and make a great excuse to try out your favorite rain dance. Our advice is simple. Pack your bag, then take half of those things out and leave them back home. It's common to hear people wishing they'd packed less stuff, but we've never heard anyone complain that they didn't bring enough. Costa Rica is a relatively inexpensive country, meaning even if you realize you forget to pack some crucial item you can just pick it up on the trip for cheaper than what it would have cost back home. Oh, and there's no need to pack gallons of North American water in your bag just in case there's no fresh drinking water in Costa Rica… yes, we actually had someone do that, and yes you can drink tap water in Costa Rica. We REALLY suggest just bringing your regular bank card from home and using the Costa Rican ATMs to get cash; in our experience it's much cheaper than any currency exchange service in Costa Rica or even at home. 10,000 Costa Rican Colones is worth around $20 USD, so don't freak out if your dinner bill costs 5,000 Colones. Chill out –that's about 10 bucks. Tipping isn't a native Costa Rican custom, however, it has become a part of what is expected from Westerners like us. We suggest tipping for services in a similar way as you would at home; that is, if your dinner bill is 5,000 colones then we encourage you toss 500 colones in on top of that. That extra dollar is extremely appreciated by the service staff. All of our trip leaders are gay, and all certified leaders must undergo a rigorous training routine that includes deep-fried cricket eating, and impromptu dancing tests. Apart from these vital skills, we require our leaders to know their stuff really, really well. Underneath their fun and quirky facades, our guides are experts and passionate about what they do. Don't hesitate to ask them to teach you some Spanish or question them about a random statue you might see along the way. 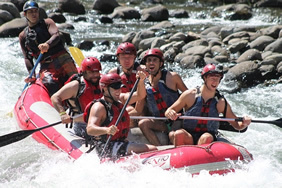 Their job is to help ensure that this is your trip of a lifetime by taking the hassle out of your trip and enabling you to experience everything you came to Costa Rica for. We do absolutely everything possible to avoid needing such a mundane awakening. A world without alarm clocks is one we want to be part of, and your "rise and shine" while in Costa Rica will come from the sound of crashing waves, an biligual parrot squawking, or perhaps even monkeys jumping onto the roof of your bungalow. 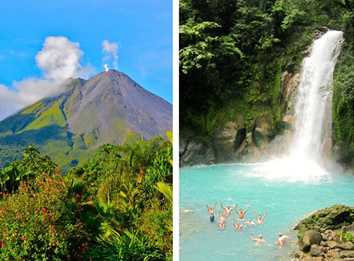 Extending Your Trip For many people, 12 days in Costa Rica just isn't enough time. If you're lucky enough to be able to stay longer, or if you decide to quit your job and become a beach bum in Central America for the rest of your life, we'd be happy to extend (or cancel!) your return flight. We've been all over the area, so don't think twice about asking where to go or what to do after your Detours trip is complete. 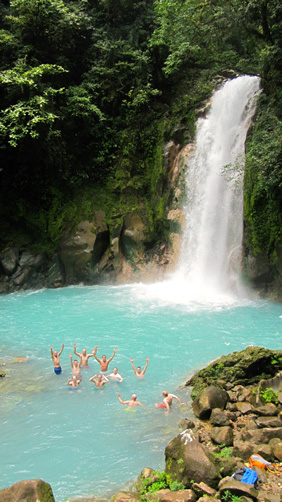 Our Costa Rica group trips are run with a minimum of 4 travelers and up to a maximum of 15 travelers. 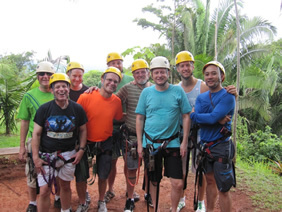 Ages of group members vary but the majority of our travelers are in their 30's and 40's. Whatever the age of the guys on our trips everyone's already got something in common, an exciting new experience in a new country! Each group is led by a Detours trip leader who is there to ensure everything goes off without a hitch, allowing you to focus on having the time of your life! No problem! Don't worry, lots of our travelers come solo and our trip will provide plenty of chances to meet great people both inside and outside of our group, including other solos. As far as your accommodations go, you've got two choices. We can either pair you up with another solo group member in a two-bed room, or you can have your own room for a reasonable surcharge. Relax – we won't keep you from updating your Facebook status the whole trip. There are internet cafes and WiFi all over the place. If you're more the "E.T." type and would just rather call home, feel free to pick up a calling card at a corner store and make use of the many local payphones.